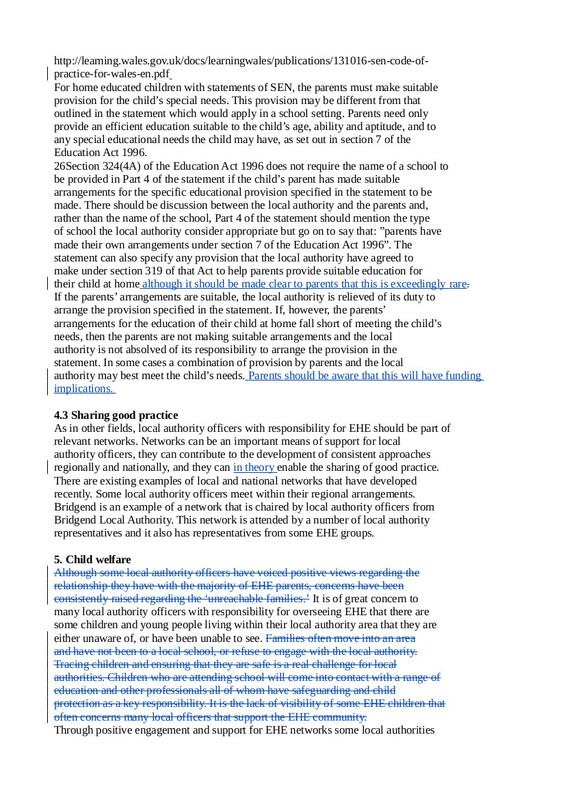 This is the sixth of a series of blog posts commenting on tracked changes to the draft Elective Home Education Guidance for Wales. The public consultation closes on July 3rd. 4.2 Statements SEN, it is not up to LA to decide cease the statement just because nothing is being provided. The criterion for ceasing a statement is where the child or young person would no longer require additional support if they were in a school or institution. Throughout the draft Guidance, there is insufficient consideration of impact on children with SEN and disability especially Autistic Spectrum Disorder with emphasis on face to face meetings and questioning the child/young person. Lancashire offers a useful example of how it can be done. Because Lancashire is not looking to assess provision, families are less likely to feel they have to keep the authority at bay. The LA finds that parents are more ready to admit to having problems and to ask for help. Safeguarding concerns are referred through the correct channels. It is recognised that the problem isn’t that “nobody sees” or “nobody says anything” but rather that the right people aren’t told in the right way, with a proper procedure for follow-up to make sure that a concern has been investigated. Lancashire also seeks to ensure that people working in related areas who might come across home education have a proper understanding of both the scope and limits of legislation relating to EHE and the remit of the home education service.